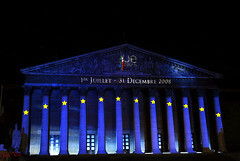 L’Assemblée Nationale Européenne, a photo by CedEm photographies on Flickr. A short while ago, Yves Gounin (who is a high-ranking government official in France) wrote a very interesting article in the journal Politique étrangère. The Catalan website VilaWeb has provided a useful summary, as has Wee Ginger Dug, and the article itself is here in PDF format. It’s an excellent article, and I highly recommend reading it if you have any French (Google Translate will help you to a certain extent, but it will get confused in some places). I decided to provide a summary of my own, maintaining the author’s section headings, and focusing on the bits that are most directly relevant for Scotland. However, I very much hope somebody will soon provide a full translation into English — it’s an essential document in the Scottish independence debate. The independence movements in at least Scotland and Catalonia are united by their desire to remain in the EU, not least because doing so reassures the voters that the countries won’t be internationally isolated after independence. It’s therefore important to explore whether these new states will become EU member states automatically, or whether they will be placed in the same situation as the applicant countries of Eastern Europe, obliged to follow the long and risky process of accession negotiations. The independence supporters are therefore keen to assert that continued membership of the EU is practically automatic, while opponents claim that independence would lead to applying for EU membership from scratch. The author briefly explains how states can succeed states. It’s likely the remaning parts of the UK and Spain will try to claim continuing state status, whereas it’s unlikely either Flanders or Wallonia could do this if Belgium is dissolved. After looking at how the succession of states affects international treaties, the author concludes one has to look at the rules of each international organisation separately — one cannot conclude anything about EU accession by looking solely at international law. Looking at the EU itself, it quickly becomes clear that there aren’t any clear precedents. While there are no precedents within the EU, that’s not the case in the UN. Here the rules are clear: The new state has to apply for membership from scratch. There are good reasons why the EU is against member states splitting up. On the one hand, the EU promotes its own regional agenda but does not want to be accused of getting involved in the internal affairs of member states at the same time. On the other hand, many member states are worried about their own independence movements and believe they can hold back these by obstructing the accession to the EU of new states forming from other EU member states. However, is it reasonable and realistic to expel parts of existing member states from the EU? Can one imagine border posts on the Catalan border? The reintroduction of a national currency in Flanders? Scots deprived of their rights derived from the EU Charter of Fundamental Rights? Also, a legal argument can be taken from Article 50 of the TEU, which outlines the procedure by which a member state can leave the EU. It could be argued that expelling these states and refusing to readmit them would be in breach of this explicit procedure. Another argument stems from the EU’s founding principles: freedom, democracy, equality and the rule of law. It would be ironic if the Union denied the populations of Scotland, Catalonia or Flanders the right to self-determination, and this would undoubtedly constitute a democratic regression. An even more powerful argument can be drawn from the link established over time between the European Union and its citizens. The EU constitutes “a new legal order of international law whose subjects are not only States but also their nationals”. That means that unlike other international organisations, the EU is not only composed of states but also of citizens. The question here is whether by losing their British, Spanish and Belgian nationality, the Scots, Catalans and Flemings will ipso facto also lose their EU citizenship. It’s fair play for opponents of independence to raise obstacles to continued EU membership, but one might ask whether it’s in the EU’s own interest to complicate the (re-)admission of these states. Once the Rubicon of independence has been crossed, Europe would have everything to lose by putting these states into quarantine: its businesspeople couldn’t invest there any more, nor could its young people study there, its travellers move there freely, its fishermen sail there, etc. A practical solution must be found. The most reasonable solution would be to negotiate independence and EU membership simultaneously. It would thus be neither automatic membership nor going through the full procedures of Article 49. The absence of relevant precedents, legal uncertainty and the magnitude of the challenge will require the parties to negotiate. This is not the most illuminating answer to the question, but without a doubt it is the most realistic.